The No. 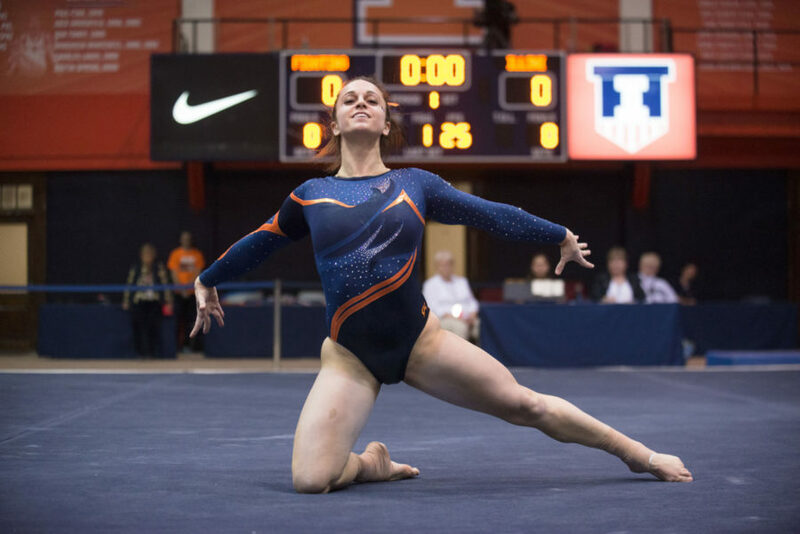 16 Illinois women’s gymnastics team failed to defeat two top-10 teams this weekend, but overall, junior Giana O’Connor still felt her team did well with the double-meet weekend, as the Illini had “really good” performances. To begin, Illinois faced No. 1 Oklahoma on Friday night at Huff Hull, losing 197.875-195.950. 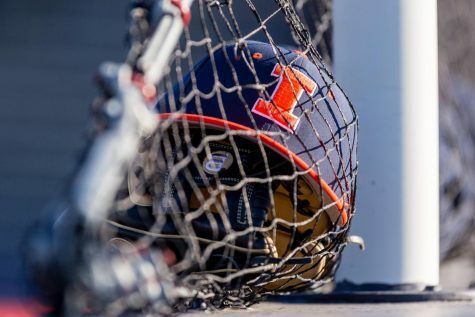 Despite the loss, the Illini were content with their performance. The Illini trailed in the entire meet, as the Sooners’ high scores were too much for Illinois to counter. But Illinois continued to improve its scores in each event, starting on vault, with a 48.725, and then scoring a 49 on the other three events. Landrus said the team needed to make improvements for Sunday’s tri-meet. “If we just continue a lot of the performances that we did and work on those little things, then we’re going to get what we want — that little half tenth back here and there — because we can’t give the judges it to take, and I think we learned that tonight,” Landrus said. Illinois still had some little mistakes at the Masters Classic on Sunday afternoon, but the team was satisfied with its second-place finish and its 196.425 score. Meanwhile, No. 8 Nebraska took first with a 197.100 on its home turf, the Devaney Center in Lincoln, Nebraska, and San Jose State finished third with a 195.150. The Illini started the meet on uneven bars, scoring a 49.250. That was Illinois’ best event total, and it helped give the gymnasts momentum going forward in the competition. From there, Illinois headed to beam and scored a 49.175. The Illini did have to count one score below a 9.8, but every gymnast stuck her dismount — something the team has been trying to improve upon. The success then carried on to floor, where Illinois earned a 49.075. Vault was the lone event in which Illinois failed to score a 49, just like in the loss to Oklahoma, but the Illini did improve upon Saturday’s 48.725 with a 48.925. O’Connor led the way on vault with a 9.900, equaling that score on balance beam and floor. She also earned a 9.925 on bars — a career high — which was enough to win her the all-around title and tie the program’s best all-around score of 39.625. O’Connor said she didn’t feel any different coming into the meet, but added it was great to accomplish what she did. She knows there are still improvements to be made, for both herself and the team as a whole, with the regular season nearing an end.